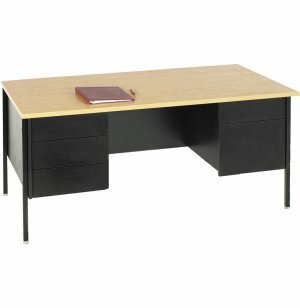 Double Pedestal Teachers Desk - Steel Legs 72"x30"
Definitely at the Head of their Class! With its clean, modern design that matches the handsome two-tone design of popular student desks, these Panel End & Steel Leg teacher's desks can give your classroom a "designer look" that is both affordable and learning-friendly. 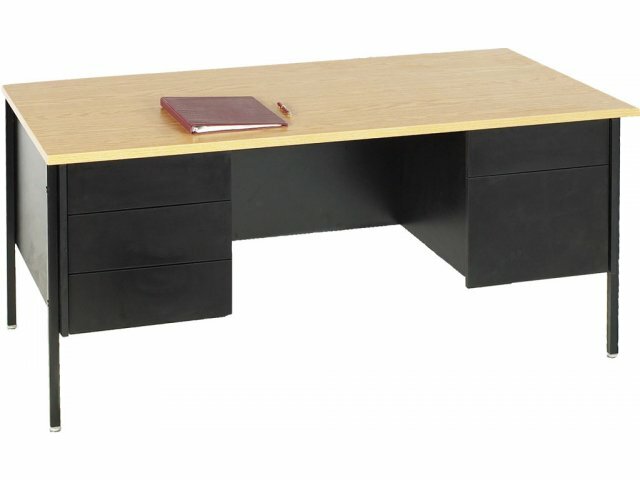 This Desk comes with five steel legs that can be easily installed. 3MM edge banding is a durable, shock-absorbing material with a bull-nosed contour for safety (no sharp edges). Top, sides and pedestals made from durable thermofused laminate on industrial-grade particle board. Lock included in one pedestal to help keep contents safe. Protective glides allow easier desk movement without scuffing floors. NOTE: These desks are custom orders and are therefore non-refundable.